For the Steve Ditko superhero, see Static (Eclipse Comics). "Virgil Hawkins" redirects here. For the Florida attorney for whom the character is named, see Virgil D. Hawkins. Cover art of Milestone Forever #2 (March 2010 DC Comics). Art by Artgerm. Static is a fictional superhero appearing in American comic books published by DC Comics. The character, a creation of Milestone Comics founders Dwayne McDuffie, Denys Cowan, Michael Davis, and Derek Dingle was initially written by McDuffie and Robert L. Washington III and illustrated by John Paul Leon. Static's first appearance was made in Static #1 (June 1993) in the Modern Age of Comic Books. Born Virgil Ovid Hawkins, he is a member of a fictional subspecies of humans with superhuman abilities known as metahumans. Not born with his powers, Hawkins's abilities develop after an incident exposes him to a radioactive chemical. This event renders him capable of electromagnetic control and generation. The character drew much inspiration and was in fact designed to represent a modern-era Spider-Man archetype. After the closing of Milestone Comics, Static was incorporated into the DC Universe and became a member of the Teen Titans team. A common misconception is that Hawkins is the son of fellow DC Comics superhero Black Lightning, who debuted much earlier and possesses electrical abilities. Black Lightning addresses the coincidence once in a Justice League narrative. Static has made numerous appearances in other forms of media. The character has been featured in various animated series including its own, Static Shock, a version of the storyline made slightly more suitable for a younger audience. Static has been featured in animated films and video games as well. An African-American teenager, Static was a key character of Milestone Comics, an independently-owned imprint of DC Comics with a greater representation of minority heroes. Dwayne McDuffie has stated that the creation of Static was a group effort. Originally developed for Marvel Comics, Static would become a main staple of the Milestone line. Much of the inspiration for Static came from Marvel's Spider-Man. When initially creating the first five characters for Milestone Comics, it was decided that Static would be created as a teenage hero who was a contemporary version of Spider-Man. Static's civilian identity, Virgil Hawkins, was named after Virgil D. Hawkins, a black man who was denied entrance to the University of Florida's law school due to his race in 1949. Milestone ceased publishing comics in 1997, but Static was saved from obscurity by The WB animated series Static Shock, which aired for four seasons and led to the 2001 comic book miniseries Static Shock: Rebirth of the Cool. The 2009 trade paperback of this series was nominated for a Glyph Comics Award for Best Reprint Collection. "Like any other awkward 15 year-old, Virgil Hawkins worries about pocket money, getting beaten up, and drugs. But recently, he's had even more on his mind: stuff like his powers, his secret identity, and drugs. Because, when innocents are in danger, and Virgil can slip away from class, the geeky youth becomes Static, the dashing, adventurous superhero!" The character was introduced in one of the first four titles of comic books published by Milestone in 1993, founded by Derek T. Dingle, Denys Cowan, Dwayne McDuffie, and Michael Davis. His early adventures were written by Robert L. Washington III and McDuffie, and penciled by John Paul Leon. Virgil Hawkins was fifteen years old when he became Static. In the comics, Virgil's family consists of his father, Robert, who works at Paris Island Hospital; his mother, Jean; and his sister, Sharon. Virgil attends Ernest Hemingway High School in the city of Dakota with his friends: Frieda Goren, Richard "Rick" Stone, Larry Wade, Chuck, Felix, and Daisy Watkins. In the guise of Static, Virgil eventually rescues "Rick Stone" from danger. Not unlike Spider-Man, the character has a propensity for witty banter and humor, especially when engaged with opponents. In addition, Virgil utilizes his knowledge of science and pop culture in various battles and scenarios as Static. A self-professed geek, Virgil is portrayed as avid comic book and video game fan, something that was retained for his DCAU incarnation. In the comics, Virgil regularly visits the local comic store, in addition to creating fan comics with his friends, and participates in HeroClix-style and other tabletop RPG games. In addition, he has been shown to be an avid video gamer at several points in both his series and the Teen Titans. In the 2001 miniseries, Static Shock: Rebirth of the Cool, it is shown that at that point in time, Virgil is into collecting Pokémon cards and he likes Pikachu (the flagship Pokémon of the franchise and a fellow user of electricity). In an interview with former Teen Titans writer Geoff Johns, he expressed interest in having Static as part of the team, stating, "I really wanted Static on the team, but there’s so much red tape there that every time I requested it DC said 'not yet' and so I never got to have him" and later stating he had plans for the character since Teen Titans #1 (vol. 3). Any obstructions were eventually resolved and Static appeared in the Terror Titans, with his Milestone continuity folded in the mainstream New Earth continuity. At the San Diego Comic-Con 2008, it was announced that Static would be joining the mainstream DC Universe where he would be added to the Teen Titans. Static made his first canonical DC Universe appearance in Terror Titans #4, battling Rose Wilson in the final round of the Dark Side Club Tournament. In June 2010, DC Comics announced that Static would be receiving his own series in 2011. The series was to be written by Felicia Henderson and drawn by Scott McDaniel, but was cancelled before the first issue could be released following the death of Static's creator, Dwayne McDuffie. However, a one-shot entitled Static Shock Special was released in June 2011, written by Henderson and drawn by Denys Cowan. Batwoman artist JH Williams III provided the one-shot's cover. A new series featuring Static titled Static Shock was launched in September 2011 as part of DC's relaunch after the Flashpoint event. The book is written by John Rozum and drawn by Scott McDaniel, who also co-writes. As part of an effort to better integrate Static into the mainstream DCU, the title takes place in New York City rather than Dakota. Doused with an experimental chemical in a gang war he was caught up in, high school student Virgil Ovid Hawkins gains a variety of electromagnetic powers and becomes a costumed crusader against crime. Like most teenaged heroes in the Spider-Man mold, he is often overwhelmed by the combined responsibilities of his career as a superhero and typical adolescent problems. A resident of the city of Dakota, Virgil first gained his electromagnetic powers at a huge showdown between the gangs of the city, when he hoped to get revenge on a gang member who had been bullying him. The authorities arrive and release tear gas with what they believe to be a harmless radioactive marker so that any gang members would not escape arrest. The cops do not know the marker had been further spiked with an experimental mutagen called Quantum Juice (Q-Juice). This event ultimately came to be known as the so-called "Big Bang." Those who were exposed came to be referred to as "Bang Babies" because the Big Bang was their metahuman birth. When the agency behind the experiment tried to capture him, he fights back, discovering that he has gained the ability to generate, manipulate, and control electromagnetism. Virgil names himself "Static" and, armed with his wits and powers, became a superhero. For the most part, Virgil keeps his secret from his family, but his friend, Frieda Goren, learns his identity when he attempts to protect her from becoming a prize in a small skirmish between gangs. Virgil has friends like Rick Stone & Larry Wade, he also has a romantic interest in his other friend Frieda Goren but she was already involved with Larry Wade. He also has feelings for a girl named Daisy Watkins, but his 'responsibilities' as Static interfere with their dates too many times and Daisy calls their relationship off. In Static Shock: Rebirth of the Cool, Virgil is involved with a girl named Madison, but Frieda ends up fighting with her over him. Static has had confrontations with numerous Bang-Babies and other super powered adversaries: Hotstreak, Tarmack, Holocaust, Commando X, Puff, Coil, Snakefingers, Rift, The Swarm, Dr. Kilgore, Rubberband Man, Brat-atat-tat, Prometheus, Run, Jump & Burn, Boom Box, Powerfist, LaserJet, etc. Other Bang-Babies that Static has encountered include Virus, D-Struct and Hyacinth. 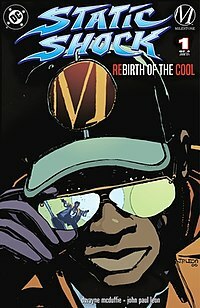 In the mini-series Static Shock: Rebirth of the Cool it is revealed that Virgil has given up his superhero career as Static. He enjoys his time being a civilian again but sometimes misses being a superhero as his friend and confidant Frieda gets him to begrudgingly admit. He eventually returns after being persuaded by many fellow heroes including Blitzen and Hardware for one final battle. After the battle, with a man named John Tower who is revealed to have been the first and greatest superhero in the Milestone Universe, Virgil decides to return to his career as Static. But as he informs Frieda it likely won't be on a full-time basis as it was before. Later in the comic line, Static is aided by allies: the Shadow Cabinet, the Blood Syndicate, and DCPD officer Captain Summers, who has a big interest in police cases involving Bang-Babies. Static teams up with Page, the sidekick to Kobalt, in order to stop a maddened Bang-Baby who had become half-fly. Static takes a moment to scold Page, who, in his opinion, seems more concerned with making excuses over their initial meet up than what was more important, stopping the danger. Static ends up joining the unofficial group called Heroes. Multiple superheroes come together to protect the town of Iberia from a dam break. Many innocent citizens perish, but the heroes are still recognized for their efforts in saving the survivors and doing what they could. Static appears among the group, quips "You started the X-Men without me", and talks his way onto the team. Minutes later, the Shadow Cabinet, now corrupt, sends a death squad after a few of his newfound friends. Following the death of Darkseid (as chronicled in Final Crisis), the space-time continuum was torn asunder, threatening the existence of both the Dakotaverse and the mainstream DC universe. The being known as Dharma was able to use energies that he harnessed from Rift (upon that being's defeat in Worlds Collide) to merge the two universes, creating an entirely new continuity. Only Dharma, Icon, and Superman are aware that Dakota and its inhabitants ever existed in a parallel universe. In the buildup to the Final Crisis, the cosmic tyrant Darkseid hires the Terror Titans to capture Static, along with a number of the other Bang Babies in Dakota for use in the metahuman deathmatches in the Dark Side Club. During his tenure in captivity, Virgil is subjected to the Anti-Life Equation and entered into the tournaments, where he presumably kills a number of combatants. He quickly becomes the champion, and reigns undefeated for a time, though in the end, he proves hard to control. To Clock King's displeasure, he has to be restricted to the lower-levels where he is kept locked up and heavily sedated. In an attempt to entice Rose Wilson and make a profit, Clock King releases Static and sets him against Rose in the ring. In the ring, the two have an intense fight where Static's lightning-fast attacks are able to injure Rose, even despite her precognition. After a drawn-out fight, Static emerges the winner, but briefly breaks free of control before being sedated once more. Static is eventually freed by Rose (albeit off panel) and takes his revenge against his former captors, electrocuting Lashina and her cohorts as they try to escape. He also briefly duels with fellow electricity-wielder Dreadbolt, defeating and binding him in metal along with the other Terror Titans. In his final appearance he's seen joining up with Miss Martian and Aquagirl, planning their next move. After the Crisis has ended, Static and the other Dark Side Club survivors arrive at Titans Tower in order to rest. Wonder Girl, the current leader of the team, offers all of the young heroes spots on the team roster, but most of them, including Terra and Zachary Zatara, decline. While exploring the Tower, Virgil strikes up a chemistry with Aquagirl, a teenaged superheroine who was briefly a member of the team during 52. During a conversation with Virgil, she claims that she enjoyed her time with the team, and wishes to join up again, a statement that influences his decision to do the same. He also playfully insults Kid Devil and Jaime Reyes after they attempt to talk to him, mocking Kid Devil over his recent loss of his abilities. He claims that he was abducted by the Terror Titans months beforehand, and realizes that his family must believe him to be dead. Believing he has no place to go for the time being, Static decides to become a Titan and live at the Tower until he can get his life together. Later, when crazed former-Titan Jericho (in the guise of Cyborg) takes control of the Tower and its systems in an attempt to kill the team, Static thwarts him by releasing a high-energy charge overloading the entire Tower, as well as Cyborg's body, saving the rest of the team in the process. During a trip to the piers in order to relax, the Titans face off with the supervillain team known as the Fearsome Five, after they kidnap Wonder Girl and hold her hostage on Alcatraz Island. In the ensuing battle, Static defeats the villain known as Rumble by tricking him into moving into a pool of water, thus amplifying the effects of his electric attacks. In the aftermath of the battle, Virgil attends Kid Devil's funeral after he is killed saving the city from a nuclear explosion. When former Titan Raven shows up at Titans Tower injured and unconscious, Static assists Justice Society of America member Dr. Mid-Nite in helping treat her, using his abilities to sedate Raven when a demon emerges from her body. It was recently revealed that prior to his abduction, Static teamed with Justice League member Black Lightning in order to stop former Blood Syndicate member Holocaust, who had tried to kill the superhero while he was acting as the keynote speaker at Ernest Hemingway High's senior graduation. Virgil finally decides to see his family again after learning that a deadly virus has been infecting citizens of Dakota, including Sharon. After returning home, Virgil reunites with his family as well as Frieda, and learns that his girlfriend Madison has left him during his absence. He discovers that whoever created the virus is also selling limited supplies of the vaccine, and attacks the lab where it is being made. Upon breaking into the facility, Static is surprised and knocked out by Holocaust. After refusing to help Holocaust in his pursuits, Static is imprisoned in a specialized containment unit alongside Aquagirl, Wonder Girl, and Bombshell. Holocaust informs the heroes that he plans to kill them and weaponize their abilities in order to sell them, but is ambushed by the rest of the Titans before this can happen. Holocaust easily defeats them, only to be confronted by Cyborg, who has recruited former Titans Kid Flash and Superboy. The three are able to hold off Holocaust long enough for Virgil and the others to escape, and ultimately the combined might of all ten Teen Titans is enough to defeat the villain once and for all. After this, Virgil reconciles with Frieda and tells her that he has tricked his family into believing that he has taken part in a lengthy quantum physics fellowship, thus giving him an excuse to live in San Francisco with the rest of the Titans. He also makes one last attempt to win back Madison, but she silently rejects him. After this, Virgil and the other Titans decide to head home, now with Superboy and Kid Flash as members again. After a mission to another dimension to rescue Raven, Virgil returns home to find that he no longer has his powers. Furious and scared over his situation, as well as his inability to help Miss Martian awaken from her coma, Virgil attempts to leave the Tower and return to Dakota. He is stopped by Cyborg, who tells Virgil that he will be of no help to anyone back home without his abilities, and tells him that he has arranged for Virgil to be taken to Cadmus Labs to find a way to get his powers back. Superboy offers to travel to Cadmus in order to support his friend, but Virgil tells him that the Titans need him now. Following a farewell breakfast, Static leaves for Cadmus, with Wonder Girl assuring him that he will always have a place on the team. During the events of Flashpoint, Barry Allen accidentally alters history after a battle with Professor Zoom. In the newly created reality, Static is shown back in-costume with his powers restored. Static's 2011 redesign and cover of the recent second solo series (Static Shock #1). Art by Scott McDaniel. Following the reality-warping events of the 2011 Flashpoint storyline, Virgil and his family leave Dakota for New York after an unspecified tragic incident that, among other things, left his sister Sharon as two separate, identical entities. The vigilante Hardware gives Virgil a new costume and modified flying disk, which enables the two to remain in contact despite living in different cities. Hardware also gives him an internship at S.T.A.R. Labs as an after school job. During his first major battle, Static defeats the villain Sunspot and earns the attention of a criminal syndicate known as the Slate Gang. 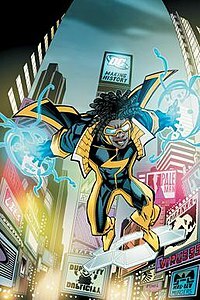 Static Shock was cancelled as of issue 8 as part of DC's "Second Wave" of The New 52 titles and replaced by an alternative title. In Teen Titans, it is revealed that Virgil designed the cape and wing apparatus of Red Robin's costume while at S.T.A.R. Later, while recuperating at S.T.A.R. Labs from a previous battle, the Titans seek Virgil's help in curing Kid Flash, whose cells Virgil discovers are rapidly deteriorating as a result of an alteration of his powers. Virgil provides Kid Flash with a new costume (based on a personal sketch for a variant of the Flash's costume) containing materials that realign his molecules while stabilizing his powers, saving Kid Flash in the process. Static's powers allow him to control electromagnetic phenomena, in particular allowing him to manifest, manipulate both electrical and magnetic energy—Static's powers are best described as superconductor electromagnetism. Static's powers center around electromagnetism, making him part of the Earth's electromagnetic field as well as capable of generating and storing his own electromagnetic energy. He can choose to keep the electromagnetic energy that he currently holds in his body by controlling the current and voltage for whenever he wants to use it. Static's body can generate raw electromagnetic energy, which he can control at will for various purposes. Such uses commonly include magnetizing objects, electrocuting opponents, levitating objects (such as manhole-covers or his self-built metal saucer for use in flight) and people, restraining or adhering people/objects to various surfaces in the form of "static cling", generating "taser punches and kicks" with effects similar to a stun gun and at times enough power to send opponents flying during close combat, various electromagnetic displays as well as electromagnetic nets or cages, blinding flashes, generating thrown ball lightning, producing electromagnetic pulses, and generating electromagnetic force fields to shield himself from attacks, even stopping bullets in mid-air. In the comic book series, Static has displayed the ability to manipulate subatomic particles, in particular electrons. In at least one instance, he has used this ability as an offensive attack to easily knockout a villain with the villain's own electrons. As well as releasing surges of electromagnetic energy, Static can also drain sources of electricity, such as power lines, batteries and fuse boxes to recharge/replenish his own energy supply. He has also displayed the ability to regenerate his powers after being completely drained by energy-draining villains. Whenever Static has used his powers to a high degree, or experience any other such large energy-drain, he will also experience a sudden, acute sense of fatigue, as his electromagnetic powers are tied into his own bioelectric energy levels. In the episode "Aftershock", in the 1st season of the animated series, an analysis of his blood shows that Static's electrolytes/blood-salt levels are higher-than-normal, highlighting that Static needs higher blood-salt levels to support the use of his powers, but the higher sodium levels seem to have no effect on his health. Static can also sense and feel-out sources of electromagnetic energy, able to tell if a seemingly abandoned area is actually hot or not. Static can use his powers to hear radio waves and tap into phone lines, including listening in on the police broadband and music stations, as well as making calls, and is also able to use his powers to mimic the uses of electronic devices such as a CD player (in "Aftershock", he also called himself a "human CD player, (even got Surround sound"), and is even able to use his powers to use an ordinary trashcan cover simultaneously as a shotgun microphone and a loudspeaker. It's notable that Static has more of a distinctive advantage in cities than anywhere-else, as shown in the events of "Aftershock", as even in a park, surrounded by trees, Static could make use of the metal pipelines under the ground with his magnetic powers. In both the animated series and comic book, he is shown using his powers to mimic that of a blowtorch allowing him to cut and wield metal together. In the animated series, Static's powers grant him resistance or immunity to forms of mind control, since the human brain is an electromagnetic organ. In "Attack of the Living Brain Puppets", Static is immune to Madelyn Spaulding's ability to hear the thoughts of others and exert control over their actions, (as speculated by Richie,) Static's greater bioelectric field shields him and his brainwaves from any attempts at reading his mind and asserting control over him, as also seen in the second part of "A League of Their Own", when one of Brainiac's mind-controlling devices shorts out shortly after being placed on Static. This trait has also been adapted into the comic book mythos; in Terror Titans, Static is shown to have resistance to Darkseid's Anti-Life Equation, coming back to his senses. Following the events of "Flashpoint", Static is given a new flying disk that now contains a holographic interface and is capable of collapsing into separate pieces or re-configuring into various forms for various uses and applications. In addition to allowing Static to remain in contact with Hardware, the disk also displays charts and other information relevant to the mission at hand. Virgil has also begun using a three-piece detachable bō staff both activated by and used in conjunction with his powers for use in close-ranged fighting. Static's body has been shown to automatically heal itself, even from what would otherwise be lethal wounds, when drawing in large amounts of energy from a nearby energy source. Tim Drake has stated that Virgil's understanding of molecular structure rivals the Flash's. Virgil Hawkins is a highly gifted student with a particular interest in the sciences. He is a talented inventor and a natural strategist. Virgil also possesses an almost fanboyish knowledge of comic books, role playing games, pop culture, and science fiction. Static's primary weaknesses are insulators, as his powers have little or no effect on them; as shown in his battle with Rubberband Man. Wood seems to be the one he has the most difficulty with, as it cannot be electromagnetically manipulated, levitated, or damaged. In the animated series, he has a vulnerability to water which (as water is a conductor of electricity), if he gets taken and drenched by surprise, shorts out his powers until he can dry off and replenish them. He can, however, fly in the rain without short-circuiting. This weakness only applies in the animated series as Static has never shown a weakness to water in the comics and has even used it to his advantage. Static appears as a major character in the 2010 limited series Milestone Forever, a project designed to detail the final fates of the Milestone launch characters prior to being assimilated into DC's continuity. In Static's tale, the reader first learns that Virgil is attending his ten year high school reunion, and has given up his life of crime-fighting and is now pursuing a career in medicine. Rick (now going by his television moniker of "Richie") is also now working as a director in Los Angeles, and is open about his homosexuality. Without warning, Hotstreak (recently released from prison and now calling himself Firewheel), attacks the reunion, claiming that he now realizes that Static must have been one of his old classmates. Virgil briefly takes up the Static mantle again for one last fight with his old nemesis, and eventually defeats him. During this time, it is also revealed that Sharon is now married and pregnant, and that Robert has died. Rocket is implied to have taken over as the new Icon. The story then skips ahead another ten years to show that Virgil is now married to Frieda and has two children, Larry and Sadie (both of whom have inherited his electrical abilities), and now works as a doctor. The story ends with the couple reflecting on their life, and Virgil playfully asking Frieda if she wants him to return to his role as Static. She simply smiles and tells him "absolutely not", and the two passionately kiss. Static has a number of supporting characters in his from best friends Rick Stone, Larry Wade and Frieda Goren to sometime love interest Daisy Watkins, and so on. In The Fresh Prince of Bel-Air, there is a framed copy of Static #1 on Will and Carlton's wall in the pool house. The character Static was developed into the lead of the animated series Static Shock with some changes in the material, generally to make the character more suitable for a younger and wider audience, but still with a focus on contemporary relevance. In the series' first two seasons, Static's outfit was a Blue coat with yellow inner lining and stripes on his coat sleeves, a white shirt with his trademark black lightning bolt symbol, black pants with a white mask, and yellow goggles. By season three, his wardrobe is mostly black and blue with some gold/yellow highlights, and the yellow goggles are replaced with dark blue shades; this wardrobe later appears in his Teen Titans comics appearance. His future self wears a similar, but slightly darker tone-wise, scheme. In the animated series, Virgil Hawkins (voiced by Phil LaMarr) is a fourteen-year-old honors student at Dakota Union High School who gains his powers by a mutagenic gas explosion, dubbed "the Big Bang" by the media, which grants numerous residents of Dakota superpowers; those affected are likewise dubbed "Bang Babies". Virgil lives with his widowed father Robert Hawkins, a social worker and the head of the Freeman Community Center, and his sister Sharon Hawkins, a university student and hospital volunteer. His mother Jean Hawkins died a few years prior, the victim of a stray bullet while she worked as a paramedic during a riot; her death causes Virgil to develop an intense fear/hatred of guns. In "Static in Africa," it is revealed (or at least hinted at) that Virgil and his family are all of Ghana ancestry (although no relatives are mentioned). Static idolizes other positive black superheroes in his world, such as Soul Power, Anansi the Spider (who befriends Virgil and calls him "his hero" as well), and particularly the Green Lantern John Stewart. Over the course of the series, Static teams up with many DC heroes including Batman and Robin, Batman's future successor Terry McGinnis, the Justice League, and even Superman himself. The episode "Future Shock" reveals that by the time of Batman Beyond, Static is considered one of the world's greatest heroes; he also has a son who is hinted to be a hero as well. The adult Static appears in the Justice League Unlimited episode "The Once and Future Thing Pt. 2: Time, Warped", voiced again by Phil LaMarr. He is still an active member by the age of 65. Static appears to have aged little in the forty years between Static Shock and Batman Beyond. Although Batman states that Static in his time is at least fifty, he appears to be in perfect health when he is finally shown. In the ten years between Batman Beyond and his appearance in Justice League Unlimited, the only change seems to be that his hair has finally grayed. Static explains that this was due to advanced medical science in the future. During a battle against the Jokerz, Static accidentally fell into a random time portal, which is undone when time is repaired. When everything's back to normal after the time warp is fixed, Static is still alive in the future. It is also shown that his flying disk now deploys in halves out from beneath his boots. Virgil appears in Young Justice: Invasion, voiced by Bryton James. He first appears in the episode "Beneath" as one of the teens abducted by the Reach. He has his first speaking role in the series on the episode "Cornered", where Virgil tells Black Canary about the experiments the Reach had put him through. He unknowingly displays his manifested electrical powers when a bunch of paper clips ended up stuck together by his electrostatic abilities. In the episode "Runaways", he and his fellow abductees (based on the various ethnic heroes from Super Friends, with Static taking the place of Black Vulcan) run away from Star Labs when they grow sick of the constant testing. He and the other runaways are stopped by Blue Beetle and help him to battle Red Volcano, saving the scientists and staff. When Blue Beetle ignores the potential harm he is causing during the battle and tries to forcibly take them with him, Virgil and the others escape. The group then are met by Lex Luthor who recruits them. In the episode "The Hunt", Virgil and his friends destroy everything in sight relating to the Reach until Luthor convinces them to rescue the members of the Team from Warworld (which is now under the Reach's control), using a Father Box to get there and track down Superboy. Once on board, they are attacked by the Reach's enforcers and Black Beetle, who causes them trouble until Arsenal intervenes and frees Mongul, triggering a fight between him and Black Beetle. After the Team is rescued, Nightwing offers a place on the Team for the runaways, but they refuse when he kicks Arsenal off the Team despite him saving their lives and they leave. Arsenal then tells the group that Luthor was using them and the abductees break ties with Luthor and leave with Arsenal. In "Endgame", Virgil and Black Lightning take down the Magnetic Field Disruptor in Dakota City. Impressed, Black Lightning tells him if he ever needs a mentor, he should let him know. After the battle, Wonder Girl and Robin welcome Virgil, now going by the name "Static", to the team. He does not wear his costume in this show, however his street clothes resemble those of his Teen Titans costume, but in the episode "Endgame" he is shown with his circled lightning logo on his T-shirt briefly on the Watchtower. In this version, when Static flies on a disc, his electricity is shown to be directed towards the ground, presumably caused by the grounding effect. In the third season (titled "Outsiders") two years have passed with Virgil under the wing of Black Lightning. He is later concerned when Jeff admits that he resigned and hoped that he, Virgil, could find a mentor who was not damaged. In October 2014, it was announced that Warner Bros. would be launching a live-action Static Shock program from Reginald Hudlin as part of the company's new Blue Ribbon Content digital division, and are eyeing Jaden Smith for the role of Virgil Hawkins/Static. On May 24, 2015, actor Tyler James Williams announced in an interview that Jaden Smith was cast as Static, but this has yet to be confirmed by Blue Ribbon Content or by Warner Bros. Hudlin, DC Comics Chief Creative Officer Geoff Johns, and Denys Cowan are collaborating on the live-action project. Black Lightning showrunner Salim Akil stated that he "would love" to bring in Static into the "Lightningverse" some time in the future, whether that be a cameo on Black Lightning, or getting his own show. Virgil has a non-speaking cameo in Justice League: War. He can be seen sitting behind Billy Batson during Victor Stone's football game. His appearance is similar to that of his Young Justice counterpart. This is the character's first appearance in a DC film. On August 30, 2017, when asked on his Twitter account if the character could have a feature film set in the DC animated universe as part of the DC Universe Animated Original Movies, producer James Tucker responded that there's interest in Static on the studio, but that there have yet to be plans to make one. Static appears in DC Universe Online. He is seen as part of the Lightning Strikes DLC, fighting alongside other Titans. Static is a bounty for those on the villain campaign and is sighted in the west of the Temple of Crime. He wears his dark colored Teen Titans costume in this game. Static is a downloadable playable character in the mobile version of Injustice: Gods Among Us. Static was set to appear as a playable character in Injustice 2 and even had his design finished for the game, but was cut from the game for unknown reasons. ^ "The World's Finest - Static Shock". Worldsfinestonline.com. Retrieved 2011-01-28. ^ Fox, Margalit (February 23, 2011). "Dwayne McDuffie, Comic-Book Writer, Dies at 49". The New York Times. ^ "A Comic A Day...: Static Shock: Rebirth of the Cool #1". Acomicaday.blogspot.com. 2007-02-25. Retrieved 2011-01-28. ^ "2010 Glyph Awards nominees announced | The Beat". Comicsbeat.com. Archived from the original on 2011-07-26. Retrieved 2011-01-28. ^ "C2E2: DC Nation". Comic Book Resources. 2010-04-16. Retrieved 2011-01-28. ^ Brady, Matt (2008-07-26). "Milestone is Back, and in the DCU". SDCC '08. Newsarama. Retrieved 2008-07-27. ^ "DC Universe: The Source". Dcu.blog.dccomics.com. 2011-01-24. Retrieved 2011-01-28. ^ Fri, 02/11/2011 - 9:00am. "Static Shock to star in his own book this spring | DC Comics". Dcu.blog.dccomics.com. Retrieved 2013-02-13. ^ "Henderson Pays Tribute with "Static Shock Special"". Comic Book Resources. Retrieved 2013-02-13. ^ Matt WayneFelicia Henderson (2011-06-01). "Comics | DC Comics | Comic Books, Digital Comics and Graphic Novels". DC Comics. Retrieved 2013-02-13. ^ Wed, 06/08/2011 - 8:20am. "The Next Generation of Justice | DC Comics". Dcu.blog.dccomics.com. Retrieved 2013-02-13. ^ "DC gives us a first look at the new Teen Titans, Legion of Superheroes, and more!". Io9.com. 2011-06-08. Retrieved 2013-02-13. ^ Kushins, Josh (January 12, 2012). "DC Comics in 2012-–-Introducing the "Second Wave" of DC Comics The New 52". The Source. DC Comics. Archived from the original on January 14, 2012. Retrieved January 14, 2012. ^ "The Fresh Prince of Bel-Air: The Butler's Son Did It Episode Summary on". Tv.com. Retrieved 2011-01-28. ^ "Warner Bros. Digital Division Announces "Static Shock" Live-Action Project". Comic Book Resources. ^ Todd Spangler. "Warner Bros. Unveils Digital Short-Form Studio: Blue Ribbon Content". Variety. ^ "Warner Bros. eyeing Jaden Smith for Static Shock?". Flickering Myth. October 27, 2014. Retrieved October 26, 2014. ^ "Jaden Smith Confirmed As Static Shock By Tyler James Williams". May 24, 2015. Retrieved May 24, 2015. ^ "CBR TV @ SDCC: Geoff Johns Talks "The Flash" TV, Making "Justice League" Count". Comic Book Resources. ^ Morrison, Matt. "Black Lightning's Season 2 Premiere Has One Big Static Shock Clue". ScreenRant. Retrieved 23 January 2019. ^ "FLASH FACT! Electricity, The Flash, Central City Join DCUO". Newsarama.com. ^ "Interview: DC Universe Online's 'Lightning Strikes' DLC Pack Is On The Way". mtv.com. Archived from the original on 2011-11-20. ^ Chavez, Steven. "Static Shock almost made it onto the Injustice 2 launch roster, character designer shares concept art". eventhubs.com. Retrieved 26 May 2017. Static at Don Markstein's Toonopedia. Archived from the original on December 7, 2017. This page was last edited on 8 April 2019, at 21:23 (UTC).